The Donsky - Solomon family has a history of over 160 years as a premier merchant in the Houston market. The exacting standards imposed upon retailers that have gained membership with organizations such as the Better Business Bureau or the Independent Jewelers Organization confirms that Houston Jewelry is one of the finest retailers in the world. In addition to loose diamonds and wedding bands, we have a remarkable selection of fine jewelry and watches in all price ranges, along with a wide selection of fine gifts, silver-plated and sterling silver hollowware to choose from. We carry fine crystal by Baccarat and Waterford and are the South's largest dealer of vintage Herend. Membership in these organizations is offered only to those merchants who meet certain criteria, which includes environment of the store, product and business integrity and ethics, full disclosure in the sale of diamonds and fine diamond jewelry and use of non-conflict diamonds, as well as extraordinary customer service in the everyday practice of serving their clients. As professionals in the industry, Houston Jewelry is now in its third generation of active management of this business, and the family has been merchants in the Houston area since 1866. Many members of our staff have been employed by the firm for well over 30 years! Our customer list consists of well over a quarter million names and our sales have topped over 1.1 Billion dollars since 1953. Our customers love our family environment and keep coming back for years to come! WE ARE THE ORIGINAL VOLUME FINE JEWELER OF SOUTH TEXAS! 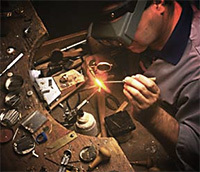 All of the World's Top Jewelers must abide by the standards and practices set forth by the Society. These practices include routine inspections, compliance with strict standards regarding training of personnel, product quality, and the aesthetic experience of the store and customer care. This will provide the customer with an exceptional relationship with the merchant and integrity regarding the product and the entire experience. Our Master Jewelers are among the finest artisans in the business and we can personalize your purchase with custom engraving. Call us today at 1-800-495-2630 to create your custom piece. 2009 - Houston Jewelry is voted Click2HoustonsBest.com "2009 Best Designer Jewelry"